Guns N’ Roses singer Axl Rose isn’t the man he was “Yesterdays.” In the band’s prime in the ‘80s and ‘90s, the frontman for the hard-rock legends would be hard-pressed to complete an entire show, and as temper tantrums and riots maligned Rose’s reputation, G ‘N’ R tickets were a risky buy. It was like investing in a Lauryn Hill ticket in 2018: It’ll probably be great—if they show up. But present-day Axl is a different animal. He’s been the picture of professionalism and “Patience” on the multi-year “Not In This Lifetime” tour, which began with warm-up dates in April 2016 and has two dates remaining in South Africa and Hawaii. 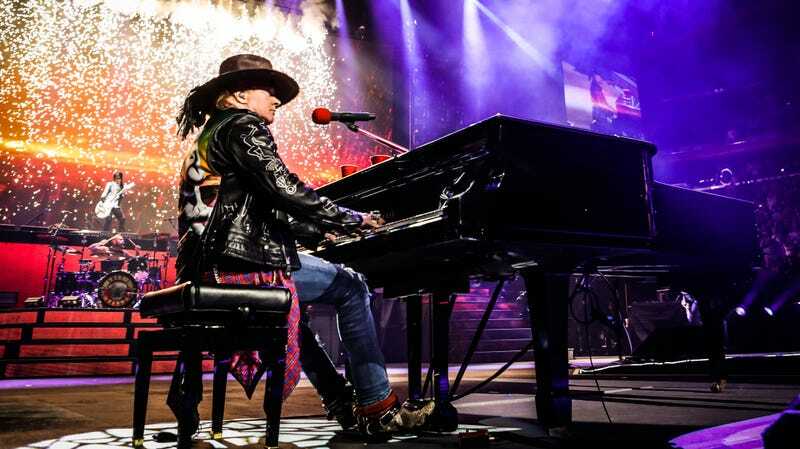 So, when he left the stage early Sunday night in in the UAE’s “Paradise City,” Abu Dhabi, you might expect him to be suffering from a temporary relapse to his old Axl ways. “Not so,” say his bandmates, who cut through the internet’s “Double Talkin’ Jive” and explained via Twitter that Rose was “severely ill” but still able to power through 20 songs of their planned 28-song set. But “Don’t Cry.” Axl has good reason to heal up, and quick. Besides finishing up the Guns ‘N’ Roses tour, there are rumblings that he’ll be back behind the mic for AC/DC. Rose has sporadically loaned his services to the band as touring singer in recent years, after Brian Johnson was forced to retire from performing due to hearing loss. Earlier this year, after reports that the partnership between AC/DC principle songwriter/perpetual naughty schoolboy Angus Young and Rose would continue, Rose Tattoo frontman Angry Anderson confirmed that the pair are currently writing new material together. No word yet on what caused Rose’s ailment; a Spaghetti Incident has not been ruled out. Axl, as well as fans in the front row, must just be glad it was “November Rain” and not “Mr. Brownstone,” if you catch our drift.